(Above: Ismaili Community Engaged in Responsible Volunteering (I-CERV) participates in the July 4th parade in Santa Monica, California.) The Ismaili Muslims are a culturally diverse community living in over 25 countries around the world. They adhere to a 1,400 year tradition of Shi'a values that are expressed through a commitment to a search for knowledge for the betterment of self and society; embracing pluralism by building bridges of peace and understanding; and generously sharing of one's time, talents, and material resources to improve the quality of life of the community and those among whom they live. First arriving as students from many parts of the world in the 1960s, Ismailis have continued to see the United States as a haven of peace and a land of economic opportunity. Today, Ismailis are a part of the social, educational and economic fabric of cities across the US, where, through both individual as well as community-sponsored programs, they have made wide-ranging contributions to the civic life of the communities in which they reside. Building on a centuries-long intellectual tradition, the Ismaili community collaborates with civic organizations, universities, civil society institutions and faith-based communities to encourage education and discourse on a diverse range of topics. Key partners include the University of Texas, the Boniuk Institute at Rice University, the University of California, Los Angeles, the University of Florida, Emory University, the Museum of Fine Arts, Houston, the Dallas Museum of Art, and the Los Angeles County Museum of Art. Support of civil society and encouraging civic engagement are key objectives of the Ismaili community, which has held voter registration drives. It recently hosted a live televised debate between Sugar Land's Mayoral candidates at the Ismaili Jamatkhana and Centre in Sugar Land, and held a similar program at the Ismaili Jamatkhana, Plano. Additionally, members of the community participate frequently in numerous volunteer service initiatives organized by civic officials and civil society organizations. Open to the general public, these events are intended to facilitate dialogue and contribute to a more pluralistic society. Programs hosted have included exhibitions, and educational and cultural programs, often in partnership with other local organizations. The Ismaili community has a long tradition of caring for its members. Its governing institutions provide oversight and assistance, under guidance from the Aga Khan, in areas ranging from health and education, to economic forums, and opportunities for youth to engage in sports, camps and intellectual activities. In implementing its programs around the world, the Ismaili Imamat and various agencies of the Aga Khan Development Network have collaborated with national, provincial and state governments as well as a broad range of civil society organizations. They have Protocols, Agreements of Cooperation and Memoranda of Understanding with over 20 states and nations that provide a framework for collaboration between these entities for the purpose of improving the quality of life of people in a number of countries. The headquarters of the Aga Khan Council for the United States of America are located in Houston, Texas, and numerous volunteers throughout the country provide their time and talent toward improving the quality of life of the community. There are seven regional Aga Khan Councils that administer programs and manage the facilities used by the community, in dozens of cities across the country. In the United States, three Agreements of Cooperation have been signed between the Ismaili Imamat and the States of Texas, California and Illinois. These Agreements call for collaboration between AKDN agencies and institutions affiliated with the States, in areas such as health sciences, education, environmental stewardship, economic development, agricultural sustainability, and culture. 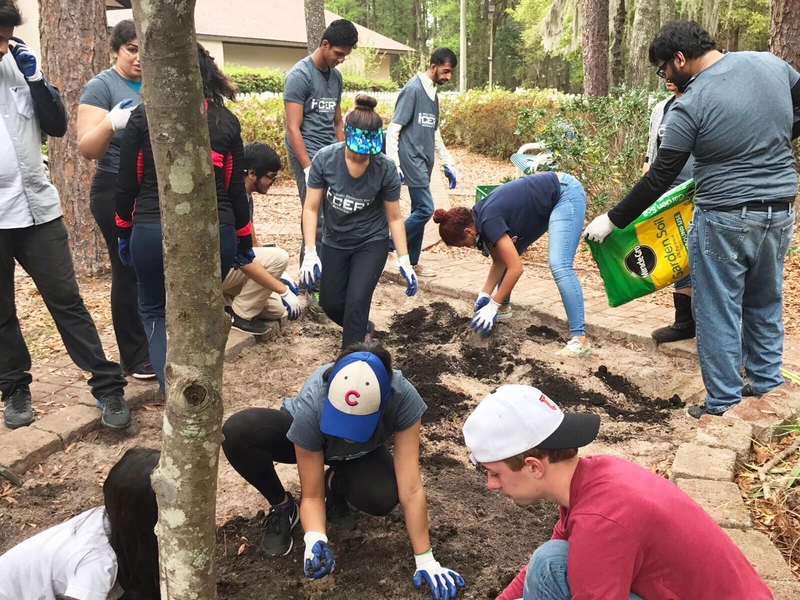 I-CERV (Ismaili Community Engaged in Responsible Volunteering) volunteers plant a garden for a homeless shelter in Ocala.